Quietstep, the performance floor for ballet can also be used for contemporary and jazz. Foam backed to reduce the sound of the shoes. Quietstep needs to be installed over a floating wood subfloor. Product can be installed directly on a floating wood subfloor, stage or hardwood surface—temporarily, semi-permanently, or permanently—using top tape, Double-Faced Tape, 4" Installation Tape, adhesive, or ReUseIt 2.0. 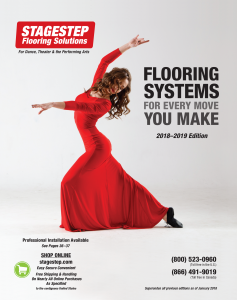 The ideal subfloor for Quietstep is Springstep lV, Stagestep’s floating wood subfloor. Installation on concrete (or other rock-hard slabs) will not reduce shock. Installation on carpet can result in the floor “wrinkling” when working on it. Consult with Stagestep for the best results.